The adoption of plastic pallet systems for global shipping purposes has increased over the years for a number of reasons. Plastic pallets are durable, reusable, clean and do not transport unwanted critters from one country to another, and, thus, do not require heat or chemical treatment prior to use. They are also lighter in weight, which is a benefit for shippers, and are recyclable into new plastic products. Plastic pallets also have made it easier for food and beverage companies to meet increased sanitary regulations because the pallets can be washed down after each use. 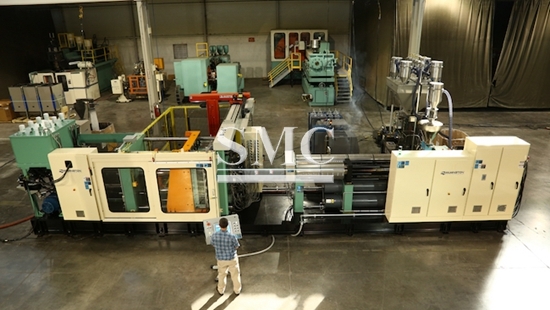 Large-tonnage injection molding machines are required to manufacture the pallets. Wilmington Machinery (Wilmington, NC) introduced the company’s first Pallateer molding machine in 2010 because of increased demand for plastic pallets. The continued success of the Pallateer machine recently caught the attention of a European company looking to mold plastic pallets in-house. The first step in this project for Wilmington was to design a pallet that specifically met the customer’s needs and was cost-effective to produce. Next, the molding system was designed, built and installed at the Wilmington plant. Once installed, test pallets were run with the customer in attendance, who received training in the operation and maintenance of the system. Next, the entire system was disassembled and re-installed at the customer’s facility in Europe. The Pallateer system for this customer included variable frequency hydraulics and other state-of-the-art machinery features. It uses a structural-foam injection method for high specific strength and works well with 100% recycled material, including granulated flake. The system comes with full automation, molds, pallet-transport systems, nitrogen generation, material blending and loading equipment, mold chilling and other options, explained Wilmington Machinery. Since its founding in 1972, Wilmington Machinery has been building high-performance, low-pressure structural foam molding machines. In addition, the company builds custom extrusion, thermoforming and industrial blowmolding machinery, along with a primary line of high-capacity rotary blowmolding systems for polyolefin monolayer/multilayer barrier packaging. Wilmington will showcase its machinery at NPE2018 in booth W1823.